Q-Connect Paper on Board Ring Binders. 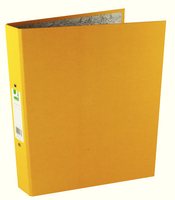 High quality, 2 ring binders, features include plastic label holder on spine for easy identification and indexing and a ring mechanism that opens and closes easily. Size: A4. Capacity 25mm. Colour - Yellow. Approx Dimensions (CM): D37 W32.5 H12.5. Approx Weight (KG):2.36.